The problem with the winter season is that it can cause the pipes in your home to freeze up. 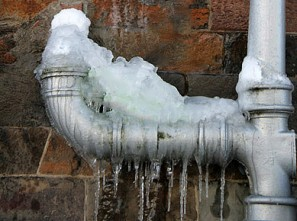 Your pipes can quickly freeze and thus put you at risk of serious damages. The damages that can come about after a frozen pipe bursts can be substantial. Several gallons of water can flow out of your home and into your foundation, thus causing a substantial amount of damage over time. The pressure from the leaking area can especially become problematic. Plumbing services can help you out with getting frozen pipes and problems relating to them from being more of an issue. Plumbing services are available to provide you with several solutions to help you correct problems relating to those pipes. Plumbing services can help you by adding air to your pipes. This includes compressed air that may be moved through your pipes to help heat them up. This in turn helps you keep your pipes from being stuck in the same temperature for far too long. Can the Pipes Be Fixed? You can also get the pipes fixed in the event that damages come about as a result of the pipes being frozen. A sealant can be used in some cases through a dig-free procedure that entails proper compounds being added through select sections in your pipes. This in turn will let you get the most out of your pipes while being less likely to wear out. Have You Check The Ducts? Sometimes the weak duct work in a space can be a threat that can possibly cause pipes to freeze up. Ducts can be sealed off carefully as needed so it will be easier for you to keep your pipes from taking in far too much air and causing them to freeze up again. You can contact your service provider to help you out with getting insulation added to your space. Insulation can be used in your pipes to keep them from being influenced by the air in your area. This can especially work on pipes that are a little lower into the ground than others and needs to be secured from frosted conditions in the soil in the winter. It’s typically easier to get a flexible foam-based material inserted into your pipe work to make this turn out well. Such a flexible item can fit into your pipes without forcing anyone to have to dig into your piping system. This can be ideal but it will have to be reviewed regularly as the insulation can wear out from all the water that moves around over all that time. Still, it will at least keep your pipes protected. This can work with some liquid treatments although they might have to be restored on occasion while being properly inspected. Sometimes insulation may work on larger pipes that are able to take in the added layer of protection being included in the process. Contact plumbing services for help with frozen pipes as soon as you suspect they are in your home. You must keep those pipes treated right before real problems can come about. This entry was posted in Plumbing Services and tagged dallas plumber, Dallas Plumbing Company, plumber dallas, plumbing in Dallas by Whit Kinser. Bookmark the permalink.